Happy belated 2015! In the new year, we’ve been reflecting about clients, their supporters and those whose mission focuses on healthy lifestyles. One of our best experiences was working with the Louisville Sports Commission and the National Senior Games. The National Senior Games is a sports competition held every two years for seniors from North America. With more than 10,000 competitors and 20,000 spectators, it the largest multi-sports event specifically devoted to adults ages 50 and older. 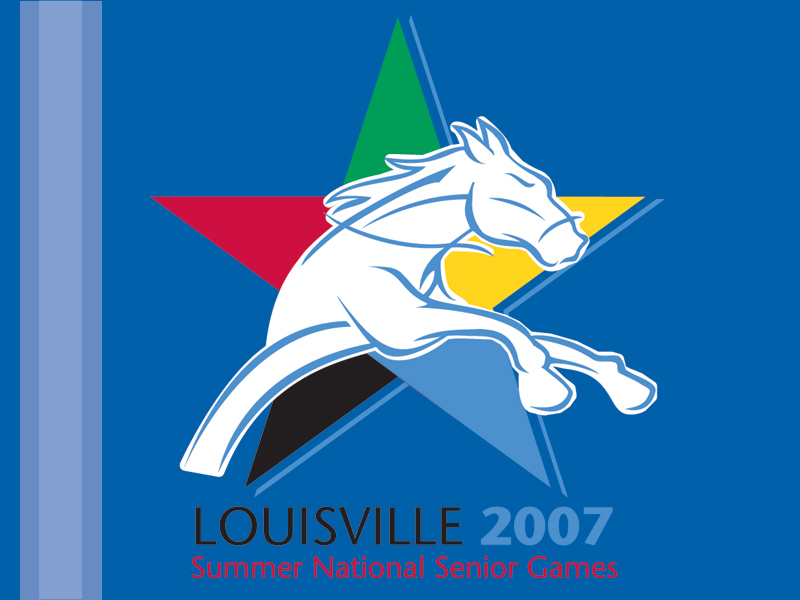 The custom made Louisville Senior Games logo. 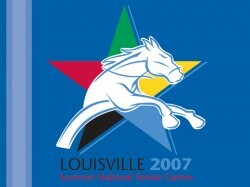 The Louisville Sports Commission was bidding on hosting the competition in 2007. To host an event of this size the entire community has to be a part of supporting it. So the Commission asked for a planning study to be completed. They wanted evidence that organizations, businesses and foundations in the city and region would support an event that would raise the awareness of healthy living. The planning study, successfully completed by GF&M, reflected community support, and identified volunteer leadership, sporting venues, along with potential sources of financial support to move the project forward. The Sports Commission contracted with GF&M to conduct a campaign for the Games. With leadership from the Louisville Host Committee, we were successful in generating over $4 million in local and national support for the Louisville Games. In fact, GF&M’s role with the Senior Games extended beyond Louisville. We created a multi-year sponsorship for Humana and Astrazenaca both of which are still supporting the Senior Games today. 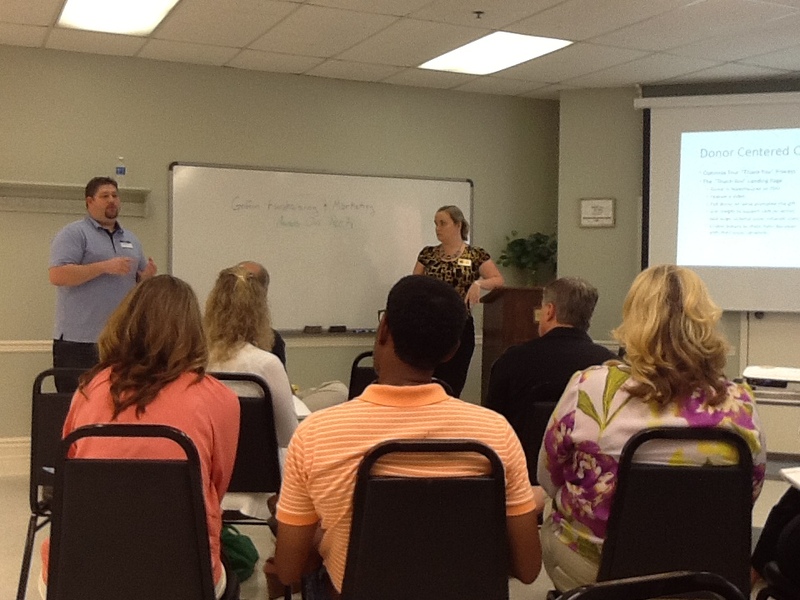 Last Thursday Griffin Fundraising and Marketing hosted our first workshop. We focused squarely on how to make your nonprofit website simple and efficient for donors while providing great content in a deliberate way. The workshop speakers were husband and wife tag team Liz and Scott Hack. Liz is a Senior Consultant with GF&M and has had over 13 years of experience in marketing, sales and public relations. Scott Hack is a Real Estate Broker at Finish Line Realty and self proclaimed geek who was using email before AOL came out with “You’ve Got Mail”. Through out the morning the two covered tips, best practices and How To make your nonprofit website easy to use. Just one of the many ideas for a more efficient site was to prominently display your “Donate Now” button on your website by making it a different color and a bigger button than the others on the page. 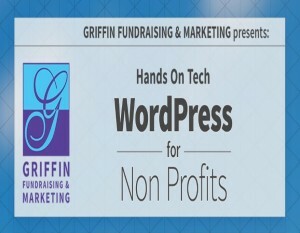 We also talked about why GF&M prefers WordPress as a platform for a nonprofit’s website. Worldwide, WordPress based websites account for 20% of all sites on the Internet today. That’s more than 76 million sites. Plus, it’s easy to use and very inexpensive to operate. We had a lot of great discussion with the group who attended. Thanks to all who attended. If you have more questions on your nonprofit website send us an email or give us a call at 502-671-0680. We’d be happy to help. 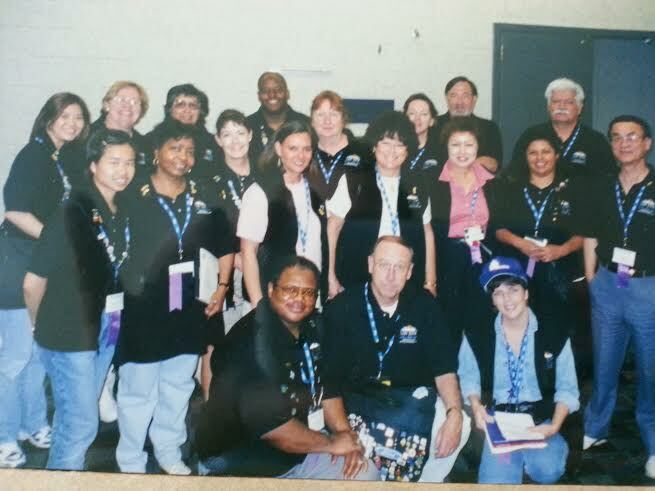 In 2001 GF&M had the honor of working with this fabulous group of volunteers during the Intel ISEF hosted in San Jose, California. Our role was to support the fundraising and event management of the International Science and Engineering Fair (ISEF). This host committee worked tirelessly to create one of the best Intel ISEF’s ever. As a firm, we are very proud of our headquartered city. As a native of Louisville, I have a personal belief that as a community member it is my duty to be an ambassador for the home team. Every new “transplant” I meet, I welcome them to Louisville and try to provide a few new cool things they should discover about the city and the state. When GF&M partners with Louisville’s Convention and Visitors Bureau (CVB), we have that same opportunity, but on a whole new level! Since 1992, GF&M has had the opportunity to partner with the CVB on many different projects like the Intel ISEF, the Lewis and Clark Bicentennial and the Vietnam Helicopter Pilots Associate to mention a few. In the 1990’s, as FFA was just starting to think about moving the National Convention out of Kansas and possibly to Louisville, GF&M was tapped by the CVB to help develop a strategy for sharing this unique opportunity of bringing “65,000 blue coats” to Louisville with our corporate and civic business leaders. The question that needed a response was WHY Louisville would be interested in hosting an essentially Agri Business property of high school students. GF&M understood the challenge and proposed a strategy that would showcase the value of one of FFA programs, the leadership training. The idea was to take FFA student leaders into corporate and foundation offices, letting the students tell their stories of what FFA had done for them, and what they now, as student leaders, wanted to do for FFA and the future membership. This strategy gave Louisville leaders a first-hand experience with the quality of the student leaders. The meetings showcased the student’s ability to meet diverse leaders with a variety of interests and backgrounds, and to respond to their questions in a balanced and professional manner. The response of the business leadership was terrific! These early meetings provided the basis for the development of future relationship with Louisville businesses and foundations. As the students shared their stories, which were reinforced by convention attendees, Louisville’s respect for the work of FFA and the quality of the student participants was increased. From the early meetings, a host city committee was identified to streamline FFA’s request for the Convention including their need for volunteers, judges and funding. Today, Louisville is on a three year rotation cycle with Indianapolis. While the rotation offers challenges, it also provides the region with an opportunity to recruit these young students and future leaders back to our communities for college and jobs. 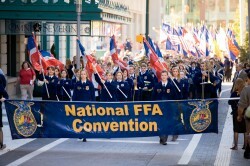 As stated in a recent Insider Louisville article, the FFA national convention comes to Louisville. That convention alone generates a $40Million economic impact for the city. We are thrilled to say that GF&M had a part in supporting that effort for the city of Louisville. Way back in 2003 the city was really starting to come together. That’s the year the city of Louisville and Jefferson County were merged into a single consolidated city-county government with the official name of Louisville-Jefferson County Metro Government. The official short form of the name is Louisville Metro. 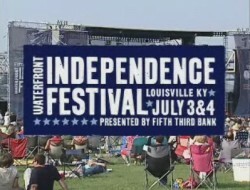 That was the year the board of Waterfront Development Corporation (WDC) engaged the services of Griffin Fundraising and Marketing to help them define the feasibility of their “big dream” for the park and one of their largest events at the time, the Independence Festival. The Independence Festival (Festival) began in 1989, ten years before the opening of 55 acres we all know today as the core of the park. By 2003, fourteen years later, the Festival became the seventh largest event in the region with an attendance of over one hundred thousand. It was one day of family fun, recreation, music and fireworks. As a free event, the Festival was a meeting place for the entire community to celebrate our independence. In 2003, the board had a vision for the Festival to further enhance the quality and appeal of the event to both the diverse local audience and the regional tourists. 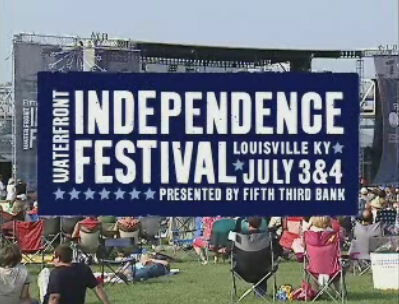 To roll out that vision and “big dream” to city and regional leaders, Griffin Fundraising and Marketing was tapped to conduct a Planning Study for the Waterfront Independence Festival. From that planning study major changes and suggestions were given to help make the board’s big dream a reality. It was from that planning study that the two day Independence Festival was created. 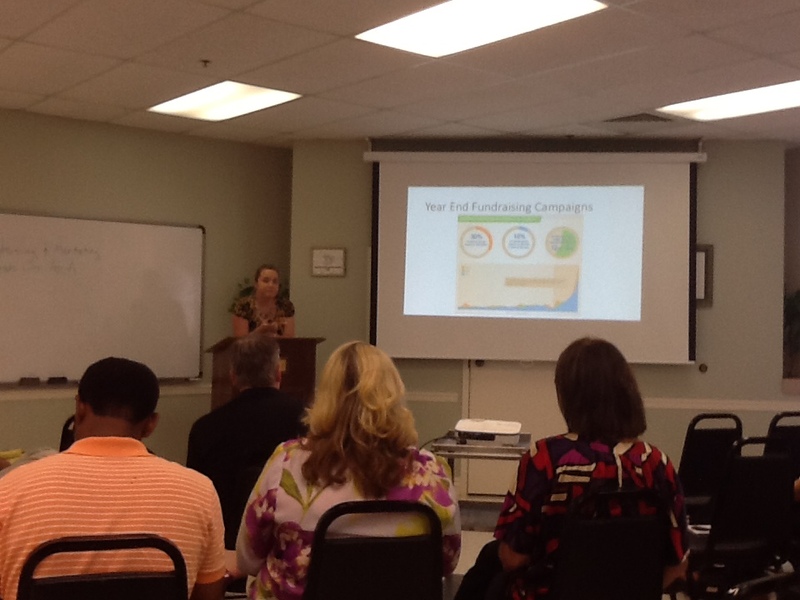 A corporate sponsorship plan was also identified and rolled out to the community. It was in 2003 that the long time presenting sponsor of the Festival was named. From 2003 to 2013 the Independence Festival was an opportunity for every part of the community and region to celebrate the history, government, and traditions of the United States. It is our hope that community support will again allow the city to do just that on our waterfront in 2015. 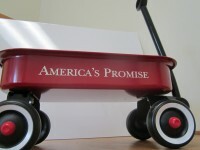 For 2014, a national group has provided a gift to celebrate the history, government and traditions of the United States this Independence Day. The Vietnam Helicopter Pilots Association, a client of GF&M’s, is holding its national reunion in downtown Louisville this weekend. As part of their programming, they have brought the American Veteran Traveling Tribute’s 80% replica of the famous Vietnam War Memorial in Washington, D.C. from July 2nd to July 6th on the South Great Lawn in Waterfront Park. 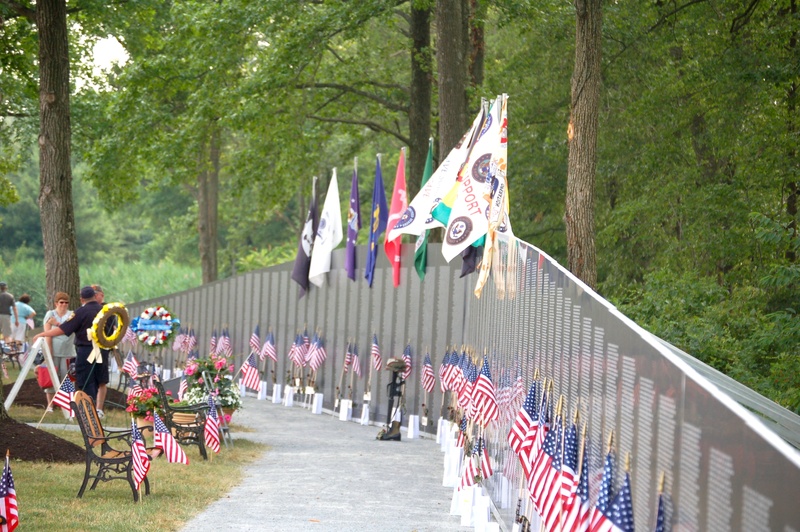 Additionally, the Reunion is setting up a static display of helicopters used in the Vietnam War near the river on part of the North Great Lawn in Waterfront Park that is open to the public on the 3rd and 4th. A Combat Assault Re-enactment starts at 4 pm on the 4th. This promises to be a very special 4th of July evening indeed! As graduation season comes to an end for secondary and post secondary schools in Kentucky, we thought we would take a look back at one of our education clients. 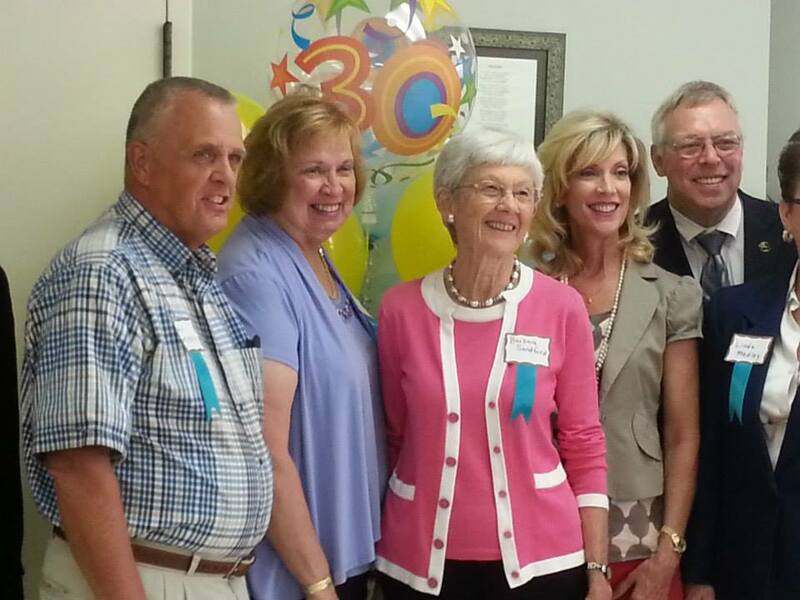 JoAnn Rooney, then president of Spalding, invited GF&M to provide additional leadership for an endowment campaign. The campaign was to directly support the students through their scholarship fund. Since Susan Griffin is a proud graduate of the university and it’s one of the oldest educational institutions in the city of Louisville, we were thrilled to be a part of the effort. In a limited time frame, we were able to complete the goal of one million dollars and secured a matching grant from the Brown Foundation. The campaign was supported by fabulous community volunteers, like Mac and Tori McClure and through their leadership the campaign was a complete success. The campaign in 2008 was a great experience for GF&M and personally for Susan to be back on campus. It is always exciting to work with such dedicated educators like those at Spalding. Since 2008 went so well, in April 2013 GF&M was again invited to facilitate a strategic planning retreat with the Advancement Team. Under the new leadership of president Tori McClure, we spent 2 days in closed door sessions reviewing and updating the goals for Spalding’s future. 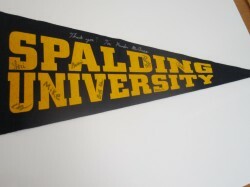 The pennant pictured above was a thank you gift from the entire Advancement Team to Susan Griffin, who acted as the facilitator for the retreat. Each member of the team signed the pennant. Honored and flattered by the gift, she keeps that pennant in her office. This week we are headed back to ’97. It’s the year Kentucky first hosted the Intel International Science and Engineering Fair. GF&M helped two Kentucky Governors and the Mayor of Louisville in bringing the world’s largest competition for high school students in math, science and engineering to Louisville not once but twice. I personally believe that this week long event helped strengthen the perception that Kentucky is a state of innovation and technology. At the time, some 1200 student competitors from 35 foreign countries came to Louisville. There were over 1000 judges and some 1500 volunteers. Now, the competition has well over 80 countries involved with many more judges and volunteers. The Opening Ceremonies for the event were held at night on the Churchill Downs track. It was the first time Churchill had ever hosted an evening event and the first time the general public were allowed to walk on the same track used for horse racing at the Kentucky Derby. Susan Griffin with six Nobel Laureates who were invited to Kentucky as part of the Intel ISEF in 1997. 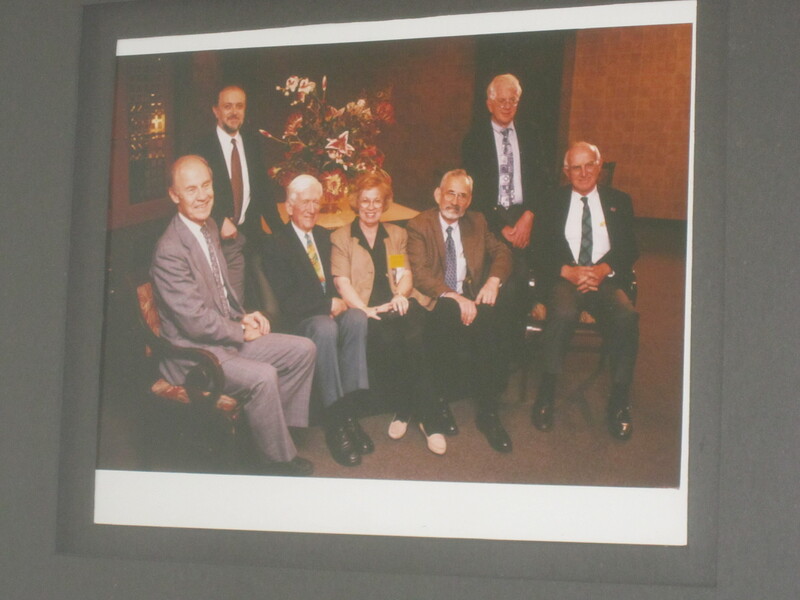 As a part of the Intel ISEF 1997, GF&M helped to invite six Nobel Laureates. They visited Jefferson County Public School classrooms to interact with middle and high school students. This marked the largest gathering of Nobels in the state of Kentucky and the first time Nobels were involved with secondary school students. What a first that was for the state of KY. I bet the guys from “The Big Bang Theory” can’t say they’ve met so many Nobels. 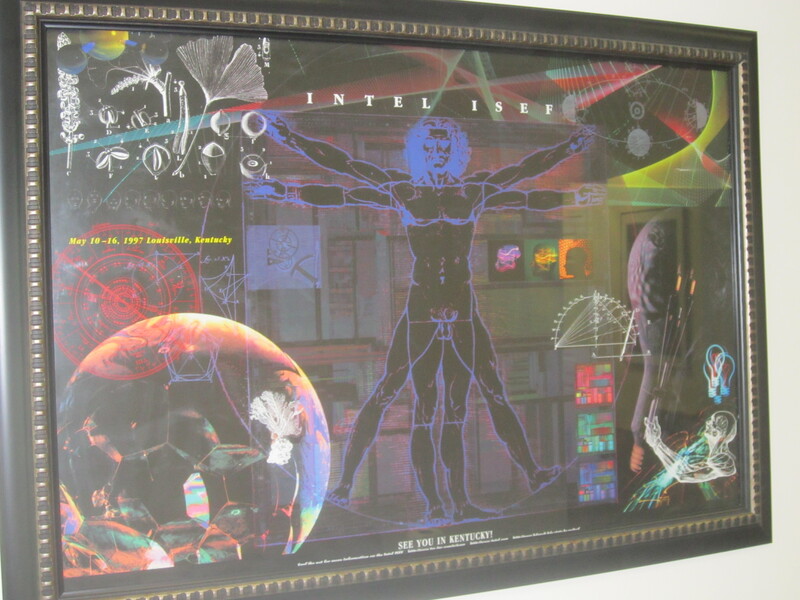 The 1997 Intel ISEF really held the bar high for future fairs. With the support of Kentucky’s Govenor, we increased the number of scholarships awarded to the student finalist. That had never been done before. The result provided Kentucky Higher Education with the opportunity of awarding ISEF finalist to come to Kentucky for their bachelors degree. Talk about injecting international award winning innovators directly into our higher education systems and ultimately our economy. Because of GF&M’s leadership during the 1997 Intel ISEF the Host Committee for the 2001 Intel ISEF requested our services in support of their fair in San Jose, California. 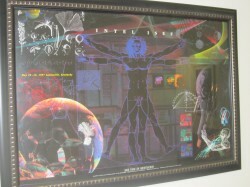 Developed all sponsorships for the 1997 Intel ISEF. 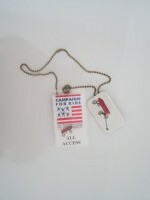 Supported Kentucky Host Committee in the identification and solicitation of cash and budget relieving items. In this addition of #TBT we jump back to September 2013 . Susan Griffin, Founder and CEO of our firm, is one of the past presidents of the Fundraising Executives of Metro Louisville (FREML). As part of the 30 year anniversary last year, many of them gathered to be honored for their hard work by the organization. 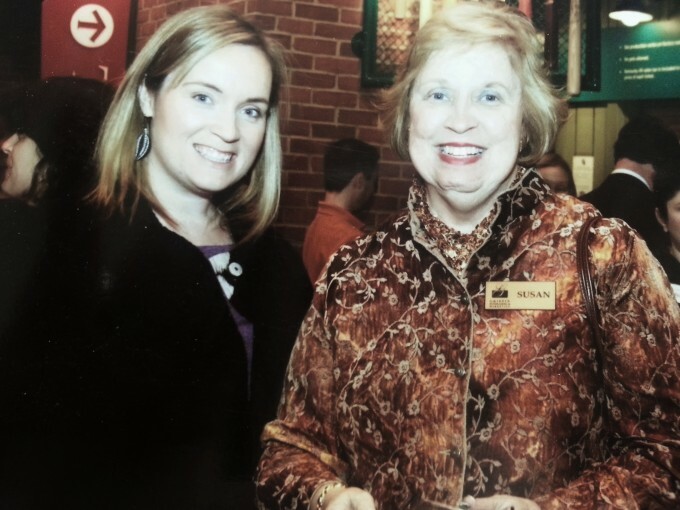 She was flattered to be invited to participate and is proud to be part of Louisville fundraising industry. Still today Susan and Liz are dues paying members of FREML.